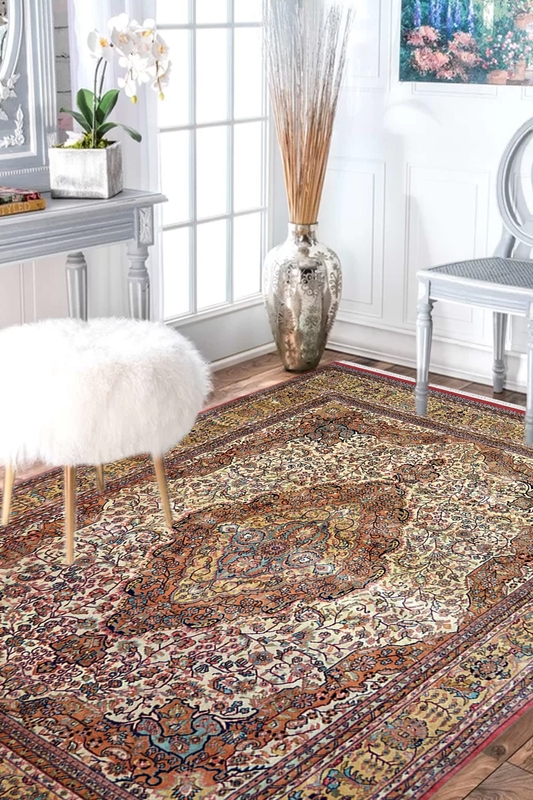 Feel the color and design with Central Medallion Handknotted Wool Area Rug. Central Medallion Kashan wool area rug is 100% handwoven on a handloom. Due to the handwoven, this carpet is highly durable. Weavers used a wet natural dying process for providing fixed and attractive color to this carpet. Central Medallion Kashan has an amazing pattern in Kashan design. The Kashan design is originated from the Kashan city which is located in Persia and this is also the oldest city and very historical place. This design shows the art of Mughal times. It has a beautiful color combination. The primary colors are Ivory and Gold. The ground is in solid ivory color with the net of flower pattern and border in dark golden color with tiny floral pattern. This is really suitable for your living room. Yes, we recommended it for the living room because this is only a place where you can show your lifestyle to other.